Summertime is upon us as kids are finishing up their scholastic year and everyone is dreaming about catching the big one on their summer break. Well, dream no more – make it a reality because the dolphin are arriving in the Florida Keys. Here in Marathon the Dolphin fishing has started with a bang. 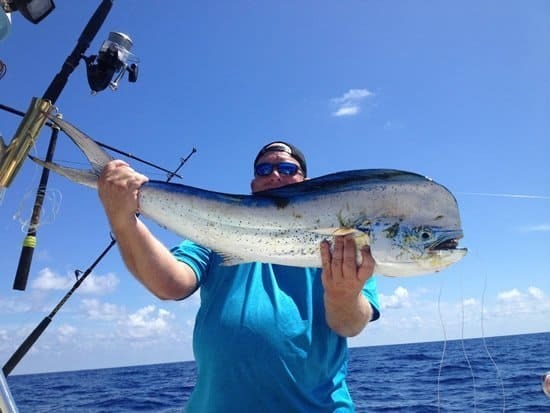 To view details about a dolphin fishing charter or other offshore & deep sea fishing charters in Marathon, FL, click here. This week, numerous big Mahi are being reported with some schoolies popping up. Most of the fish have been on debris but blind trolling has produced as well. 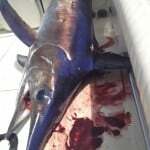 There are still wahoo lingering around the outskirts of the reef and sailfish are still being caught as well. So if you’re fishing a small boat you may not want to head way out for the dolphin, yet instead stay close for some still great action just outside the reef. I am still trolling double rigged ballyhoo on planers using the rubber band/snap swivel method. If you are not sure what that is, let me explain: I take a planer and attach it to 50 feet of 400# test mono and attach one to each of the back cleat. Then I take a few rubber bands and a few snap swivels and attach one rubber band to the swivel part of the snap swivel. Then I take my ballyhoo and feed it back to my desired distance from the boat and wrap the rubber band around the line seven times and then go back through the end of the rubber band clinching the knot tight on the line. Now take the snap part of the snap swivel and clip it to the 400# test and feed your bait back until the connection reaches the planner which is fifty feet back. Now when the fish bites, the rubber band snaps and now it’s just you and the fish. I usually bring in the planner by hand if I think it’s a big one as it can get in the way if left out. On our most recent trip we found a Cuban refugee sailboat that was empty but loaded with big dolphin. As we trolled by it the first time we hooked up with a decent 15 pound bull which was followed by a decent school of mixed sized dolphin ranging from 40 to 10 pounds. We sat there for an hour picking off 15 fish on light tackle with 30# fluoro leader. We had to practice patience fighting such large fish on light tackle, and we only lost two fish, but what a time my clients had fighting slammers on light tackle. By the time we had just about finished catching all that wanted to bite three boats came blasting in on us. We could only laugh as they were about 20 minutes late on getting into all the big fish we caught. We picked a few more after the boats came in on us, and I do believe that one of them, from a local boat rental company here in Marathon, had caught a few 10 pounders which were being finicky. After rearranging the fish on ice we blasted in to get these guys on some spearfishing on the patches. The big swarms of mangroves aren’t here yet but there are some mangroves showing up and decent size fish too, most however are really small. The wreck fishing is sparking up nicely for April and we have been getting better catches of mutton snapper every day. Either hitting the wrecks or the reefs there seems to be an abundance of mutton snapper moving around, as I have been catching a fair amount of them almost every trip. It still takes a bit of patience especially with the lack of current we have been experiencing this month. Fishing on the reef I have been using chunks of Bonita or Wahoo and Kingfish belly on a yellowtail jig ranging from 1/16-3/8 oz. depending on the current. Any fresh chunks of fish will work, so if you have blue runner or sand eel, just try to use something fresh. I like my chunks or little strips to be no larger than 2 inches but depending on the bait or size muttons that seem to be around if you keep it to these parameters they will have no problem eating your bait. Fishing the wrecks I have been using dead and live bait with no particular difference in action between the two. For dead bait I have been using Bonita and Kingfish belly strips 6-8 inches long and making sure to keep them on the bottom with little to no movement if possible. Live bait always seems to work well when I use medium sized Pinfish and large to extra-large Pilchards. Since the current has been very weak this month I have been getting away with dropping my rigs with 6 oz. weights and holding the bottom fine. You will have to increase weight if there is a strong current. The Yellowtail snapper action on the reef has been pretty good with an exception of a few days. Even though the current has been light to none we have still been getting a good bite. This year the Filefish and Triggers are horrendous on the shallow reefs which can be very frustrating when you can’t get your bait back to the tails even when you can see them. To battle this problem I have been using skin bait, which is any bait with tough skin so by the time the Filefish and Triggers chewed all the meat of the hook you were still left with a piece of skin which eventually make it down to the yellowtails and ultimately catching a yellowtail. Sometimes this tactic still doesn’t work and the only way is to make small oat balls with your bait in the center. This allows your bait to pass through the trash fish unscathed but the down side is you use a lot of oats and it gets a bit messy. I’ll keep a bucket of fresh water next to the softened oat mixture for fast hand washing before grabbing the rod. To make things go faster its best to let someone else make your oat ball if possible and take turns, this will help keep the mess down. In the past I have talked about making slop before you head out but I would wait to see how the trash fish are before you make the slop, because if you use all your oats for the slop you won’t have any to make the balls with and slop is too loose to make balls from. 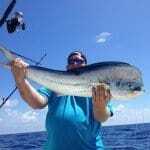 Whether you fish inshore or offshore you’re bound to get into some great action here in Marathon, and if you are looking to book a charter do it sooner than later because the Keys have been very busy this year and you don’t want to go fishing with the last captain sitting on the dock – it’s kind of like back in grade school when picking teams, you don’t want to be the last guy standing there. Do your research when picking a charter company; and most of all have a great time.